First spotted as a tiny hatchling, by Mo Laidlaw, about three weeks ago, this caterpillar of Giant Swallowtail seems a little bit bigger each time we check on it. 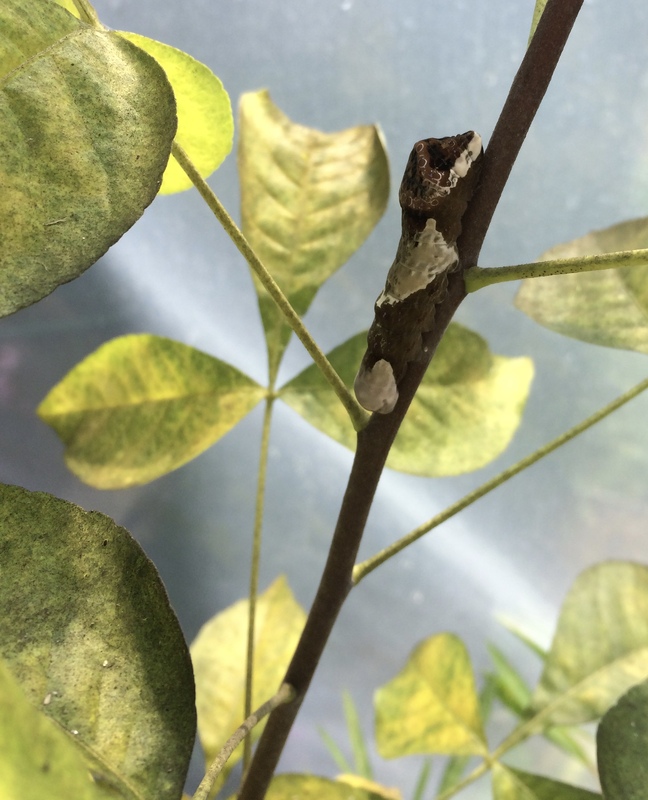 It had eaten all the leaves on its seedling Hop-tree (Ptelea trifoliata) so I moved caterpillar and denuded seedling into the hoop house underneath a larger Hop-tree. The caterpillar moved over handily. We hope that the added protection of the hoop house will allow it to get up to size before cold weather sets in. This species overwinters as a chrysalis. Giant Swallowtails have only recently moved north to the Ottawa Valley. They are still an unexpected sight this far north. They are the largest butterfly in Canada. Their caterpillars eat plants in the citrus family. Prickly Ash (Zanthoxylum americanum) and Hop-tree are the host plants in Ontario. We saw what was probably the mother of this cat checking out the Gas Plant (Dictamnus), a decorative European flower in the citrus family, in our garden but it seems she preferred the Hop-trees in our nursery for her nursery. Prickly Ash is common in some parts of the Ottawa Valley, especially on calcareous soils, but it is a large, thorny, suckering shrub unsuited to almost all gardens. The Hop-tree, native to the Carolinian zone of southern Ontario, is a neat, non-suckering, tree-like shrub with scented flowers. It is hardy as a garden plant in the Ottawa area and is a more attractive option than Prickly Ash for gardeners wanting to entice beautiful black and yellow Giant Swallowtail butterflies to their gardens. It will be very interesting to hear how this wonderful creature settles in the hoop house. I hope nothing at all interferes with its period of gestation. Caterpillars have a very high mortality. We do what we can by growing their food plants.